0-4-0 saddle tank "Linda" makes some smoke as it leaves Brownhills with the 16:00 departure on Sunday 25th March 2012. This loco was built by Bagnall, works number 2648, in 1940/41. 5043 Earl of Mount Edgcumbe was restored to traffic in autumn 2008, and on Sunday 7th December worked a 1Z74 Dorridge - Melton Mowbray charter. It's seen here passing Washwood Heath No 1 box at 11:22, making good progress but running a little under 15 minutes late. Black 5 45110 arrives at Kidderminster with a train from Bridgnorth. This shot was taken at 17:26 on Friday 10th August 2007. 46201 starts away from Bescot at 11:35 on Saturday 16th December 2006. The train is a Euston - Chester charter, which was steam hauled from Bescot to Chester and back. The land in the foreground was previously occupied by Bescot Drop Forgings, whose buildings had been demolished by this stage. It would remain unused until autumn 2013, at which point diggers arrived to clean it up for future development. In 2016 a large distribution centre for Lidl was constructed on this land. 6233 makes light work of the climb out of Walsall with a 1Z34 Chester - Paddington charter. This shot was taken 18:01 on Saturday 19th July 2008, and the train was running a bit early given that it wasn't due away from its Walsall water stop until 18:09. In fact I'd only just got into position when the unmistakeable sounds of the approaching steamer could be heard emerging from Park St tunnel. On the dark damp afternoon of Saturday 14th November 2009 Pannier tanks 9600 and 9466 hustle their train across Newton Jct. The train is 1Z52 Ironbridge - Kidderminster, which was due to stop at Bescot for water between 12:40 and 13:50. In the event it also had to stop for water at Wolverhampton, and didn't arrive at Bescot until around 13:40. This photo was taken at 14:30, using ISO800 1/400 f4.5, plus some noise reduction in the post-processing. K4 class loco 61994 and its support coach pass Hamstead at 10:32 on Tuesday 2nd March 2010. It was running as 5Z65 Crewe - Kidderminster, en-route to the Severn Valley Railway for the spring steam gala. Only six of these locos were built, of which 61994 was the second, dating from 1938. ADB968000 is seen at Stratford during the 1979 Open Day which took place on Saturday 14th July. This Class 15 loco was originally numbered D8243. Thanks to Jeff B for supplying the exact date. D8568, the sole surviving Clayton, visited the Severn Valley Railway for its 2015 diesel gala. As well as the three days of the gala itself it also worked on the preceding three days. On Monday 28th and Tuesday 29th September it did the SVR's midweek diesel turn, which is a single return trip from Kidderminster to Bridgnorth and back. On Wednesday 30th it did the driver experience turns, two return trips from Kidderminster, one in the morning and one in the afternoon. This is the afternoon outbound, 13:30 from Kidderminster, seen just after exiting Foley Park tunnel at 13:37. 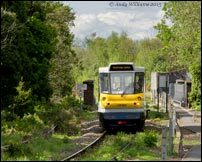 This is the last of the four driver training runs legs on Wednesday 30th September 2015, the 15:55 from Bridgnorth. It's seen descending Eardington bank at 16:16. Bescot Down Storage Sidings - Sunday 2nd October 1988. 44008 departs from Bescot with a mixed freight to Toton. In the background the Bescot breakdown train sits on the curve waiting for the signal. This picture was taken in autumn 1979 I think, although the leaves are still on the trees so it was probably early autumn. At this time the the loco was in pristine ex-works condition and carrying the number D8 under (at least) one cab window. Class 44s were regular visitors to the West Midlands in the 70s, and even near the end there was a daily Toton - Bescot duty which arrived mid-morning and returned an hour or so later. 45022 passes Walsall with 8M45 (probably 9M45 on this occasion) Bescot - Ashburys via Toton. This shot was taken on Wednesday 28th August 1985. In the train is 08701, previously a Crewe loco, but en-route here from Swindon Works to its new home at Healey Mills after being overhauled and fitted with train air-brakes. 8M45 was part of a circular diagram, the other leg being 8G12 Ashburys - Bescot via Crewe. By this stage most of the traditional unbraked yard-to-yard freights had been displaced by Speedlink services, leaving only a handful of trains like these to move any residual traffic, including shunters in transit. 37215 and 45149 stand in the shed yard at Toddington on the afternoon of Saturday 26th July 2014. At first glance it could be a BR(WR) shed scene from the 1970s, with 37215 and 45149 gleaming in the sunshine. Only the steam locos lurking in the shadows spoil the effect. The Great Central Railway held a "Mail by Rail" weekend on Saturday and Sunday 28th and 29th July 2007. D123 worked one of the Rothley - Loughborough mail trains, seen here passing Woodthorpe at 16:49. D123 again, this time going south through Woodthorpe with a late afternoon train to Leicester on Saturday 17th April 2010. D9000 runs into Birmingham International with 1S87 Ramsgate - Glasgow Central. This shot was taken at 16:24 on Saturday 21st August 1999, the second and final year that a Deltic worked this train on summer Saturdays. A convoy of preserved locos ran from Barrow Hill to Kidderminster on Wednesday 4th May 2011. 0Z55 started from Carnforth with 57601, which collected 56301, 37503, D9009 and 33035 at Barrow Hill before heading south to the SVR. However 33035 ran into trouble in the Birmingham area with a hot box, and was detached at Soho EMU depot. As a result it didn't make the diesel weekend at the Swanage railway, which is where the locos were heading. Because of the unscheduled stop at Soho the convoy was about 90 down arriving at Kidderminster. Here it is at 17:09 being propelled from the turnback siding onto the down line so that it can use the connection onto the SVR. D1062 was attached at Kidderminster, and the whole ensemble proceeded south to Swanage on the morning of Thursday 5th May. D9009 worked a 1Z29 Derby - Kingswear railtour on Saturday 4th July 2015. On the return 1Z30 train it was replaced by a Class 66 at Landor St. 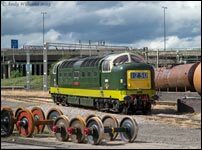 The Deltic then ran light engine to Bescot, where it was stabled on the depot. Here it is on the afternoon of Sunday 5th July, not long before a thunderstorm rolled in. D9009 accelerates away from a crew change stop at Bescot with a 1Z54 Shrewsbury - Gloucester - Burton railtour. The same loco had worked the outward leg of this tour from Burton to Shrewsbury via Cardiff and the Central Wales line. This shot was taken at 18:26 on Saturday 17th June 2017, with the loco crossing the River Tame just south of Tame Bridge. 9016 powers up the hill away from Ryecroft Jct at 09:44 on Saturday 6th April 2002. The train is a 1Z40 Crewe - Scarborough railtour, running just over 30 minutes late at this point. Charge! 55018 has just drawn to a stand at Sheffield on Sunday 15th June 1980. Evidently this railtour, which started at Kings Cross, was run in connection with an open day at Tinsley depot, which is probably where I'd been. However I seem to recall not being aware that this train was due, hence this being something of an opportunistic shot. 58048 arrives at Bescot with the 6P25 coal empties from Ironbridge. This shot was taken at 13:16 on Friday 8th November 1996. 59001 and 59004 formed an 0Z59 Crewe Electric Depot - Bescot on Tuesday 15th January 2013. They're seen here arriving at Bescot at 14:40. Both locos had been to Crewe to have GSM-R cab radios fitted. This equipment became mandatory in the south of England from the beginning of 2013. This view is now unavailable, the land from which it was taken is now a Lidl distribution depot. The New Measurement Train (NMT) went north through Dudley Port at 13:45 on Thursday 23rd March 2006. I'm not a great fan of HSTs, and took very few pics of them in the thirty years from their introduction in 1976. The NMT (New Measurement Train) passes a northbound Pendolino near Dordon. An opportunistic shot taken at 18:33 on Wednesday 10th May 2006. A Paddington-bound HST passes Fladbury, near Evesham, at 11:44 on Friday 3rd October 2008. An HST forming the 10:05 Edinburgh - Penzance passes Bredicot, near Worcester, at 15:36 on Saturday 25th April 2009. A northbound HST passes Cossington at 16:39 on Wednesday 19th August 2009. A northbound HST passes Harrowden Jct at 15:57 on Wednesday 21st April 2010. Parry People Mover 139002 approaches Stourbridge Jct at 16:36 on 11th May 2012. The only people it seems to be moving on this trip are the traincrew, although in fairness coming out of the town at this time of day will be against the predominent traffic flow. It's all rather verdant isn't it, even the trackbed. These next three pictures were taken on the morning of Friday 30th April 1993. My notes tell me that they were the only pictures I took that day, but it's unlikely that I made a special trip to visit Merry Hill to take them because monorails aren't really my thing. It's more likely that I'd been somewhere in the area to photograph a real train, and having failed in that mission I popped in to take these photos as the sun was out. In retrospect I'm rather glad that I did go that day - because the monorail was soon gone and I never bothered to photograph it again. This first shot shows a train entering the station at the south end of the main complex, and we're looking at the rear of the train here. The doors at the entrance to the stations worked automatically, opening to allow trains in, and then closing behind them. This shot shows a train departing from the same station, and running onto the nearside track over what I've recently learned is called a rotary switch. This stretch at the south end of the line was double-tracked (strictly speaking that should be double-beamed). This third train was in "McDonalds" livery, and is also seen crossing Car Park 2. This monorail was a Von Roll system. It had been out of use for six years when it was dismantled in 2001. The equipment was sold to the operators of the Broadbeach system in Australia (it's near Brisbane, in Queensland). At Merry Hill there's now little or no evidence that a monorail ever existed - this very "21st Century" looking transport system didn't even survive into the 21st Century. The "Restormel" nameplate on 47732, photographed at Chester on Wednesday 24th March 2004. Restormel is an area of Cornwall, named after its castle. The "Chimaera" nameplate on 31602, also photographed at Chester on Wednesday 24th March 2004. The crest above the plate is a reasonable representation of the mythical beast with this name. Four handles. Those bodyside doors give away the fact that this "Gresty Bridge" nameplate is on a Class 20. Specifically 20305, photographed at Walsall on Thursday 28th May 2015. The "Clydebridge" nameplate on 37324. As seen at the Glos & Warks Railway on Saturday 24th September 2005. The Duchess of Sutherland nameplate on steamer 46233. Photographed at Bescot on Monday 23rd September 2013. The worksplate on Hymek 7017. Photographed at Toddington on Saturday 26th July 2014. The fuel tank gauge on D3429. Photographed at Brownhills on Friday 6th April 2012. The wheel-shaped nameplate commemorating the centenary of the Locomotive and Carriage Institution, as carried by 66716. Photographed at Bescot on Wednesday 12th October 2016. The nameplate of D821 Greyhound, photographed at Swindon Works in 1979. 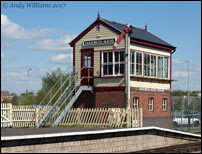 Chasewater Heaths signalbox. It has been painted, and the mesh guard removed from the front, since my last visit. In our dreams. What the railways and/or tramways of the West Midlands conurbation might have looked like if the closed railway alignments of the Black Country had been brought back into use. 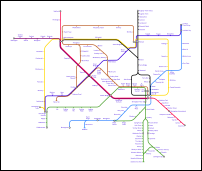 Needless to say it's complete fantasy for a number of reasons, notably that some of the alignments have been built on; and some of these lines don't go directly to central Birmingham, so don't count. Raising the money for any developments also appears to be nearly impossible, such that in the 38 years since the Cross-City line was established in 1978, providing the southern section of that line with a usable service, the only significant re-openings achieved have been Walsall to Rugeley and the Midland Metro line 1. The diversion of Stourbridge trains from New St to Snow Hill has also happened in that timeframe, but that was as much for operational reasons as passenger benefits. The only truly new piece of railway that the map imagines is the proposed curve at Bordesley to connect the Camp Hill line to Moor St.